People around the world have been starting to question the reality of faux fur and are starting to realize how it’s affecting our environment compared to authentic fur. Luxury fashion brands who have been making their apparel with real fur for years like Gucci, Michael Kors, and Fendi have become anti- fur and have started to only use faux fur for their clothing brand for sustainability reasons. Gucci’s president said, “our absolute commitment to making sustainability an intrinsic part of our business”. But only if they knew the research that has recently come out about faux fur and how it’s affecting our environment. Though faux fur is the trendiest thing to wear, even compared to real fur the process alone uses three times the amount of non-renewable energy compared to the production of real fur. But it doesn’t stop there because the production of faux fur is four times more harmful to the ecosystem because of the toxic side effects it has when its being manufactured. After speaking with the organization WRAP (Waste & Resources Action Program) I learned the fact that a third of unwanted clothing each year ends up in landfills or are incinerated after having years of wear left. After contacting them it gave me the idea to reach out to the consignment organization called The Real Real to ask about the logistics of consignment. 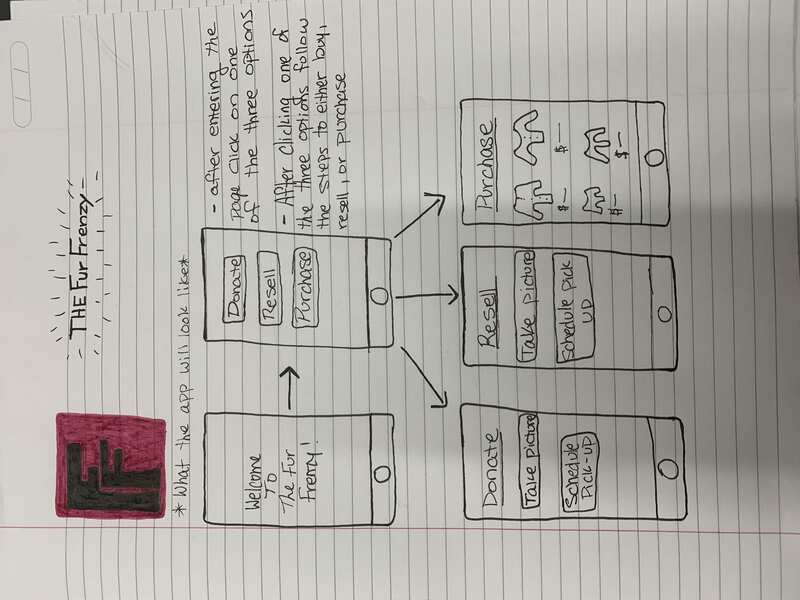 Then that’s when the idea sprung to create an app that will help recycle and reuse fur and faux fur coats. The Fur Frenzy is an app where you can donate, resell and purchase used faux fur and real fur coats. When you’re finished with your fur coat you will be able to onto the app and pick one of the three options. Next, you’ll be able to send pictures into the app and within 24 hours it will either be approved or denied then it will be sent to the sight. You’ll then be able to decide if you want to resell the coat or donate the coat and they will come pick it up and properly package it for you to be brought to the warehouse. If you choose to donate the coat, it will be given to different families that need winter coats and can’t afford it. Lastly, with a click of a button you can be able to buy an affordable fur coat just through the swipe of a finger on your phone.